Amazon.com description: Product Description: Recent years have seen considerable changes in the technology of transportation with the development of high-speed rail networks, more fuel-efficient automobiles and aircraft, and the widespread adoption of informatics in disciplines such as traffic management and supply chain logistics. 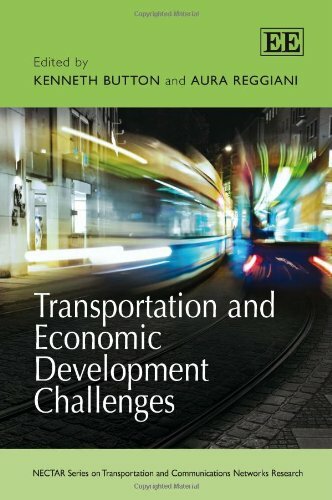 The authors in this volume assess transportation interactions with employment and income, examine some of the policies that have been deployed to maximize the economic and social impacts of transportation provision at the local and regional levels and analyze how advances in transportation technologies have impacted, and will, impact future development. Due in part to the general liberalization of markets, there have been major changes in the institutional environment in which transportation is supplied; these changes inevitably affect wider economic systems and development, although in turn these changes feed back upon transportation networks. The contributors to this work develop these and other themes from a variety of perspectives, implementing a wide range of academic approaches into their analyses. Stemming from initiatives of the Network on European Communications and Transport Activities Research (NECTAR), Transportation and Economic Development Challenges presents a body of research that exemplifies the organization's objective of fostering research collaboration around the world. This book serves as a much-needed bridge between transportation and economic development. As such, it will be of significant interest to students and scholars of economics, transport studies and development, policymakers, and anyone with an interest in broadening their understanding of the links between economics and transportation. About: Recent years have seen considerable changes in the technology of transportation with the development of high-speed rail networks, more fuel-efficient automobiles and aircraft, and the widespread adoption of informatics in disciplines such as traffic management and supply chain logistics.